Brush Bot Battle! | Imagine That! 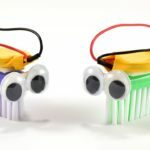 Students will turn vibrant toothbrushes, pager motors, and batteries in the into spinning, speeding bots. After a little personalization we will begin that battle! We will create battle ground and compete, one bot being crowned the victor! Students will get to take their brushbots home. This class is for students 6-12.